Last week, I posted the first two parts of my four-part mini-series on my design idols. After much thought, I found it was difficult to narrow down my list of favorites to a manageable number like say, 1, 3, or 5. Instead, I made it to 20. Truthfully, I like some more than others, but that’s only natural isn’t it? The group of designers on my Top 20 list not only create work that I find beautiful, but there are some who I admire for their joie de vivre, the gusto with which they set themselves apart. Today’s five designers are what I would call “The Bold and The Beautiful”. If the first group contained a mix of designers of varying styles (and what would most likely be my short list), the second group featured a group of gentlemen who are the epitome of chic, sophisticated design, this third group contains designers who continuously set themselves apart from everyone else through their fearlessness and bold designs. 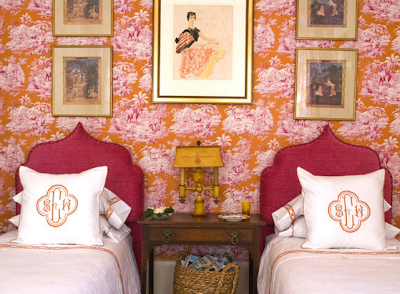 Miles Redd: Miles Redd’s sense of gusto and joie de vivre is evident in the interiors he designs. Even if daring colors are not your thing, you have to admire the fact that he just goes for it! I also love that like so many designers of generations past, his persona is as interesting and bold as his work. The bedroom that he designed for Domino (first image above) has become a sort of cult-favorite among bloggers and design lovers. Redd’s grand designs are sure to be talked about for many years to come. And let’s be honest, what’s not to love about zebra-print doors with nailhead trim? He certainly isn’t a shrinking violet! Mary McDonald: Mary McDonald takes classic, traditional designs and turns them on their heads. Take the bedroom above, for example. Every classic element is present. Everything is quite tailored and chic, but Mary’s choice of color, a deep ink blue, and her flooring choices (the bold, graphic rug in the bedroom and the chevron stripes on the bathroom floor through the door) give it a completely modern spin. Kelly Wearstler: Kelly is an icon for many young design lovers. She is supremely hip and fiercely original. It is difficult to mistake one of her designs for someone else’s. Her aesthetic is very well-defined as is her voice as a designer. She has completed both residential and commercial projects, of which I favor the latter. Personally, I feel that her avant-garde style is a little better suited for hotels and restaurants than homes, but that is just my opinion. I like grand-hotels with inspiring interiors, and Kelly delivers every time. Melissa Rufty: While Melissa’s work is decidedly more traditional than that of the aforementioned designers, there is a certain energy present in her designs that makes her work incredibly memorable. Her use of color and patterns evokes thoughts of a type of genteel, Southern eccentricity. The spaces she designs each seem to tell a story. I would gladly sit and listen! Amanda Nesbit: I simply adore Amanda’s whimsical designs and her fabulous use of color. Every room she designs is bright, welcoming, and completely chic. Even the children’s room’s she designs are extremely stylish. Amanda also uses patterns brilliantly and I love that she doesn’t take herself too seriously. She is a breath of fresh air. Did I mention any of your favorites today? Do you gravitate towards the bold looks created by these designers or do you prefer a more restrained look? This list is absolutely my top 5, minus kelly, who I agree with you is fabulous and is better in more commercial settings, I would prob replace her with Stephen Gambrel... Miles is my #1 true love though. All of these are personal favorites -- especially Amanda Nisbet and Mary McDonald: those ladies can do no wrong in my book! This is a great group. Bold, for sure. Out of this group, Amanda Nisbet has my heart. hope you had a great easter weekend. Yay! I am glad Kelly Wearstler made your top twenty!! I love her work, and while I would probably find her rooms almost too bold to live in for myself, I really gain a lot of inspiration from so many elements of her designs!! Love these posts with your favorite designers! Melissa is new to me. But how fun! GREAT list of designers. ANd that first room by Kelly... I just adore that wallpaper. Jenna Lyons will be on Oprah today! 9 by Design on Bravo: What did you think? Thank you, 002 Houston Magazine!